Read an online interview with the author. 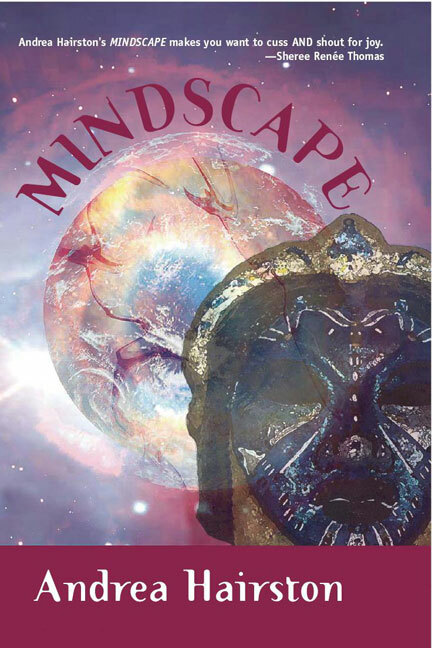 Mindscape is the debut novel of the award-winning playwright and Professor of Theater and Afro-American Studies at Smith College, Andrea Hairston. Rich in complex characters and the vivid realization of their conflicts—personal, political, and cosmic—Mindscape plays deftly over a range of registers rarely attempted in first novels and celebrates the best of humanity even as it grapples with the worst. Pulling a bass note from her pelvic floor, [Elleni] slid up her range, vibrating bones and organs until ultrasounds resonated in her nasal passages and shot out her skull. Her fingers danced in and out of the Barrier's domain. As she hit her highest notes, an archway crystallized just beyond her fingertips, and she almost lost the song. Mindscape takes us to a future in which the world itself has been literally divided by the Barrier. For 115 years this extraterrestrial, epi-dimensional entity has divided the earth into warring zones. Although a treaty to end the interzonal wars has been hammered out, power-hungry politicians, gangsters, and spiritual fundamentalists are determined to thwart it. Celestina, the treaty's architect, is assassinated, and her protegée, Elleni, a talented renegade and one of the few able to negotiate the Barrier, takes up her mantle. Now Elleni and a motley crew of allies risk their lives to make the treaty work. Can they repair their fractured world before the Barrier devours them completely? "Andrea Hairston's Mindscape starts with a vision of the way things ought to be and then takes us along on the amazing journey that must be undertaken to make that vision a reality. Her ability to fully imagine an alternate reality without sacrificing the familiar words and rhythms that provide outsiders a way into the story make this a book not just for true believers, but for those who still think they 'don't like science fiction.' After Mindscape, my guess is they'll see how meaningless such categories are. In the presence of a visionary author like Andrea Hairston, all you have to like is good writing!" "What rich and provocative territory this amazingly written first novel explores, what memorable characters it compels us to confront—renegade gene scientists and ethnic throwbacks, slippery politicos and 'expendable' Extras, ghost dancers and double consciousness diviners conjuring through an enigmatic veil—each struggling in complex circumstances to navigate survival, identity, and self in a world thrown off its course, each speaking in distinct voices that stay with you long after you've left their unforgettable stories. Science fiction at its best, Andrea Hairston's Mindscape makes you want to cuss AND shout for joy—its vision, raw humanity, and ultimate hopefulness are exhilarating. What a pleasure it is to be invited into a world so large and muscular, so sensual and rooted in global history, a world in which not only the future but the past is at stake."